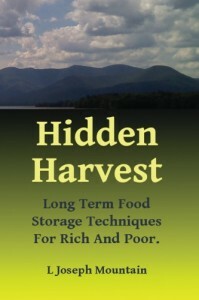 Archives for June 2013 | Hidden Harvest: Long Term Food Storage Food Storage for Rich and Poor. If you have been here before you probably notice some changes. This site is now a companion website for the new book. The ebook expands on the information historically presented here and puts it all into an easy to read story format. But don’t worry, it has even more charts and science than ever. Traditional mountain wisdom truly meets modern science. In continuing articles we’ll continue to bring you up to date research and methods you can use simply and affordably at home. Now Available as an ebook! Totally re-edited, more science, better stories, LAVISH ILLUSTRATIONS! Get yours on Amazon now! On Amazon for just $3.99. Check back for updates soon! Email to join our mailing list! Or browse the growing list or articles we’re converting from the old site. In good health! Freeze dried foods: closer than ever for home preppers. category: Uncategorized Comments Off on Freeze dried foods: closer than ever for home preppers. Freeze dried food: a method within the reach of preppers? This article has appeared by permission on Survivalblog and Freedomsphoenix. Freeze dried food is all the rage among preppers for many good reasons. It’s hard to get the kind variety of prepared foods with with any other method. Rather than offering just ingredients, we can have all kids of entrees and tasty meals. Properly freeze dried foods can exceed 30 years of shelf life, they are light weight and the foods retain more nutritional content than we see with other preservation techniques such as canning (often as low as 50% of original nutritional value) or dehydrating (usually around 80%). And unfortunately the nutrients at high risk are usually vitamins as opposed to proteins or starches. So freeze-drying is the method of choice where we want to preserve high vitamin content from fruits or vegetables. This radical new method has been around since the 1940s and was originally developed as a way to get medicinal serums and medicines that required refrigeration to places which had no refrigeration. It was in fact yet another war-inspired technology until Clarence Birdseye started using it on food. Clarence’s big contribution was “flash-freezing” foods really quickly so water couldn’t freeze into large crystals but rather into tiny crystals on an almost molecular scale that didn’t physically destroy the food’s nutrition and texture. Slow freezing doesn’t destroy things like vitamins by chemical change but by physical change: molecules are splintered, literally fractured apart is water crystallizes and suddenly expands while freezing. This is mostly what alters the texture of frozen foods. With dairy products we also see separation is water freezes out and leaves milk lipids sort of redistributed. Freezing cheese works fine but the unfrozen product will be crumbly, basically having been fractured up in freezing. Some disagreement exists about nutritional quality loss with freeze drying, I’ve read more than once that it’s basically zero. I don’t accept this with other studies showing around 20% loss HOWEVER it seems in many of these tests the prep methods included heat, blanching or other processes that could easily account for nutrient loss. The ability to flash freeze foods is one reason this method has been out of the reach of home preparers and it remains so. HOWEVER we are getting closer. Not only are some of the methods used to enhance more conventional home-prep methods now but we’re getting A LOT CLOSER to actual freeze drying at home. The level of DIY projects happening these days puts this technology much closer to prepper practice. Let’s look at what freeze-drying is without getting too technical. First off it’s a process. The food is prepared, frozen, it’s dried once, it’s dried again and then packaged in a controlled environment. The preparation phase isn’t a whole lot different from prep for canning or dehydration. We might chop the foods up, grind them, treat them with flavorings or stabilizers, whatever. It’s a really important phase because the food is rendered uniform and this gives more consistent quality at the end of the process. This is yet another edge that commercial food packagers have over us as they achieve higher levels of product consistency in prep. Next, understand that pretty much everything that happens from here happens in absolutely sealed containers or environments. The freezing phase is done the faster the better, and liquid nitrogen is really, really cold stuff. If it’s not that cold it turns into a gas. We’re talking around -60f (-50c to -80c) and this temperature is maintained constantly. Our household freezers don’t get that cold and they lose temperature rapidly by being opened and having a bunch of room temperature food crammed in. Next is primary drying and this is done with warmer temps, depending on the food this might be around 0-10f with the food under low pressure, so a pump is busy pumping air out of the drying chamber and atmospheric pressure is dropping. What happens now is that the frozen water actually starts vaporizing and getting sucked out by the pump and there are vapor traps through the system to dispose of water which condenses back out into liquid at normal atmosphere and temp. And this is another thing that makes this method so desirable. All the spaces where water used to be is getting replaced with air or nitrogen gas. With normal dehydration those spaces are usually just getting filled up with food as it shrinks and condenses. With dehydration some foods are still fluffy. Dehydrated ice cream has to be the best example. Tastes like ice cream and has this aerated consistency. Fluffy is the only word I can think of to describe it. This first drying phase of the process takes the food down to like 95% dehydration which pretty much blows away most of our conventional dehydration methods. Then there’s secondary drying which again is in a partial vacuum but the temps go higher to force out almost all remaining unfrozen water. This might be as high as 20f. At this point it’s hard to believe there is any water left but sometimes it’s chemically bound to the food and this breaks off even more. Again the whole process here is under precise partial vacuum and at just the right temps, water will go from being a solid directly to being a gas. You skip the part where you have to heat up ice, melt it into water then boil it off into steam. This is called the “triple point”. As pressure and temperature decrease for a given food, there’s this triple point where ice “sublimates” right into a gas and it’s different from food to food and preparation to preparation. That’s another aspect that remains a challenge for home preparers because commercial outfits do very large batches of very similar foods, say the entire harvest of a peach orchard. They have the advantage of being able to run test batches, do some fine tuning and then just crank out repetitive batches one after another. Bigtime gain in efficiency. But as cheap electronic sensors become readily available we might make great strides and with our laptops even automate aspects of this process. The final phase of this process is where the food is packaged and sealed, often in a dry nitrogen gas environment. Without that the food would at that point begin re-absorbing water, oxygen or whatever else is handy in the atmosphere. We really don’t want that, especially in the presence of any contaminants or chemical vapors. Naturally we pick impermeable packacking, air tight and water tight. Keep that in a cool, dark and dry environment and you have the longest shelf life of any food we can produce. So that’s what it is. So now you understand how freeze drying works, the advantages and the technical challenges to us home preppers. This is not to say it can’t be done on the bench, we can get pretty cold coolants by using dry ice and alcohol slurries for “flash freezing” and due to millions of junk refrigerators & etc., cooling pumps and vacuum pumps are readily available. There’s DIYers experimenting with hybrid systems like this and taking regular freezers down to these temperature ranges. They seem to be achieving some partial freeze drying effects which I imagine will in fact produce storage benefits but it’s kinda trial-and-error. For handling fall apple harvest I really don’t want to be fooling around with hoses and buckets and slurry mixes, I wanna process, package and stow those apples all at once and as fast as I can. What’s more enticing is watching the prices of commercial food freeze driers slowly come down into the $6k range and about half that for used ones. These are obviously smaller units, totally self-contained, about the size of a large floor model freezer. There’s the drying chamber, it’s pumps, a cooler and a condenser tank to keep sublimated water from freezing the pumps. There’s a bunch of controls and indicators to regulate things. And some of them have the freezer component built right into them. I saw one used on Alibaba for $3k, it was on wheels and it plugged into 220V power. Now $3000 plus shipping for used equipment still isn’t what most of us think of as “home prepper economics” but to some of us or groups of us, this is getting closer. Now this still doesn’t make flash freezing a practical reality for most of us and these units aren’t flash-freezers. However, besides the experimental methods above we have the possibility of buying flash frozen foods right off the shelf at the supermarket and freeze drying them. Plus, one thing I constantly learn, many of these practices can be partially implemented to improved effect. A freezer at 0f will freeze things a lot faster than one at 30f. With air moment and vacuum effect this is further improved. Ice crystals will be smaller, thence overall quality improved. What happens if conventionally frozen foods are freeze dried? They get freeze dried is what. You get the light weight and enhanced storage longevity if packaged using our best home methods like nitrogen and mylar bags. This work-around allows us to skip intensive preparation of the foods that allow for uniform drying. So you basically get that we have the bits and pieces so to speak and ways we can kinda work into state of the art technologies. This isn’t the fastest method in the world either. This whole process is stretching into days for any level or quantity of production so (for this level of equipment that is, I imagine the large producers are much faster). Plus we note that in the smaller units I discuss we don’t have that much rack space to stack food on. Maybe about 16′ square of rack space. This implies batches and holding food for processing and other hassles. All this and the associated power draw explains why these foods are so much more expensive in whole form let alone when we dry complicated entrees and meals. As such I believe that freeze drying is around the corner for those of us who produce a lot of food or who cooperatively purchase and process it. You can keep track of equipment and prices on Ebay, on used restaruant equipment sites and regrettably, on Alibaba as most of this stuff is being made in China these days.